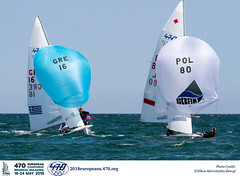 Italian sailing duo Simon Sivitz Kosuta/Jas Farneti continue to dominate at the 2012 470 Junior Worlds, hosted by Takapuna Boating Club in Auckland, New Zealand. Sailed on the Waitemata waters between the shore and Rangitoto Island, the harbour offered up a set of summer conditions. The day began a little overcast, the cool south westerly which has dominated race days so far died out, so the race committee delayed racing until 1300 hrs when the expected north easterly sea breeze was to have filled in. 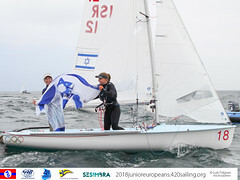 Sailors launched their boats in readiness for racing but proceedings were further delayed when the postponement flag was re-hoisted during the starting sequence as the wind changed direction significantly. A light six knot breeze finally settled and the waters were very flat, with lots of sunshine. Race five got under way at 1400 hrs but a general recall caused the race committee to bring out the black flag and two boats including the Netherlands’ Dirk Bennen/Rogier Weijers, who had been in third place at the end of racing yesterday, had to withdraw from the race for being over the line within one minute of the start. Sivitz Kosuta/Farneti have been impressive in the moderate to heavy conditions, having the speed to get the best shifts and handling their boat well, and today showed us that they are equally impressive in the light breeze, leading throughout the race and winning with a comfortable margin. 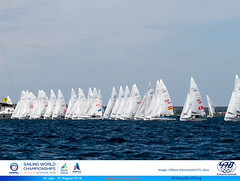 In race six they placed first once again and are now a clear 15 points ahead of their next opponents. During race five Sacha Pelisson/Nicholas Rossi of France challenged the Italians at times and made inroads into their lead on the final downwind leg by cutting in across the course, they looked very comfortable in the conditions and placed second in this race, with Magnus Masilge/Moritz Klingenberger of Germany not far behind. Overnight in second place were New Zealand's top crew, James Turner/Finn Drummond, an 18th placing in the fifth race became their drop, but they made a comeback in race six with a fourth and retain their second position. Australia's Matthew and Robert Crawford have worked their way up the leader board into third, with a 10th and third placing today. Afrodite Kyranakou/Jeske Kisters maintained their lead with second and first placings today - results which were also in the top ten of the mixed fleet. A good day for the British crew Anna Burnet/Flora Stewart who move into second overall, after a first and second scoreline, which has seen them swap positions with crew Annika Bochman/Elisabeth Panuschka just one point behind. Another two races are programmed for tomorrow and we will have to wait to see which set of conditions the harbour will deliver.